Take a look at this little beauty! 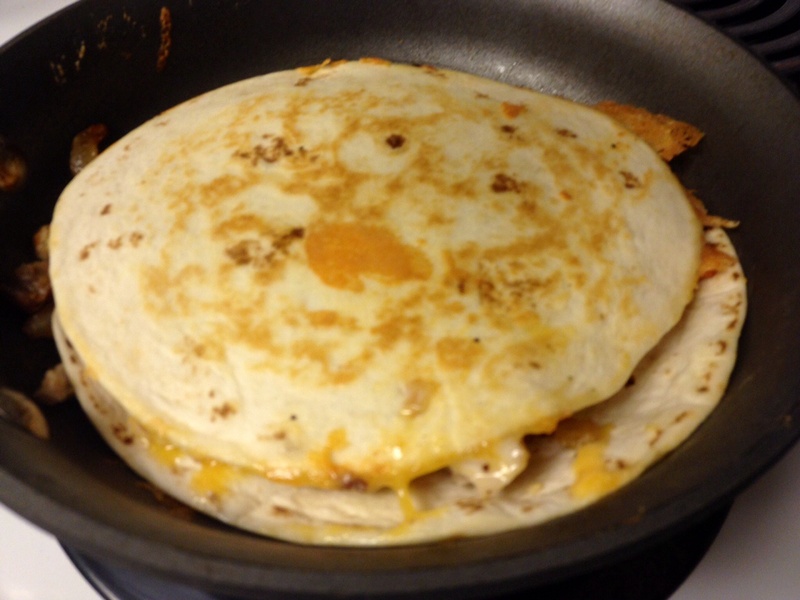 That is the delicious inside of my chicken quesadillas before I put the top on. I usually use whatever meat I have leftover in my fridge (steak, chicken, pulled pork, etc), and in this case I used leftover grilled chicken. 1. 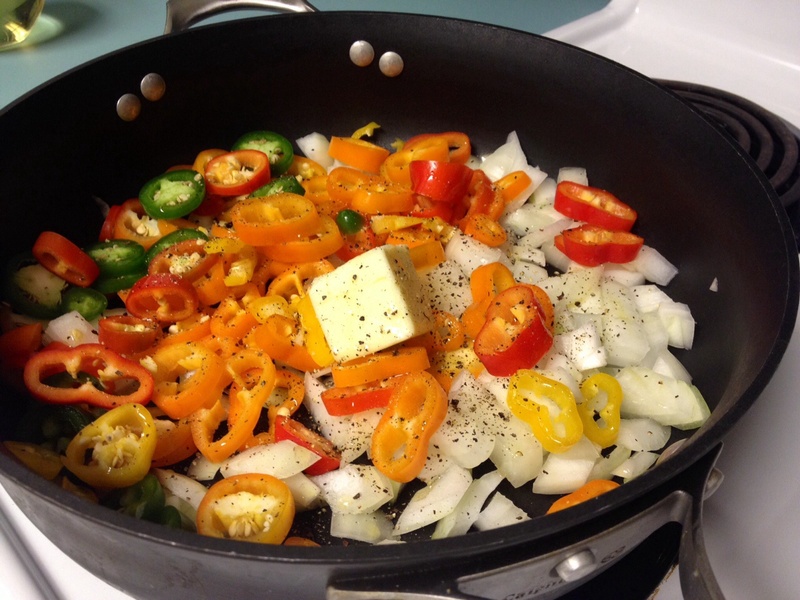 Put your peppers, onions, salt, pepper, drizzle of olive oil, and butter in a skillet. Sauté about 15 minutes on medium to high heat, then add garlic and sauté another five minutes. 2. In a different skillet you can either drizzle a little olive oil in it or rub with a little butter to get it ready for the tortilla. 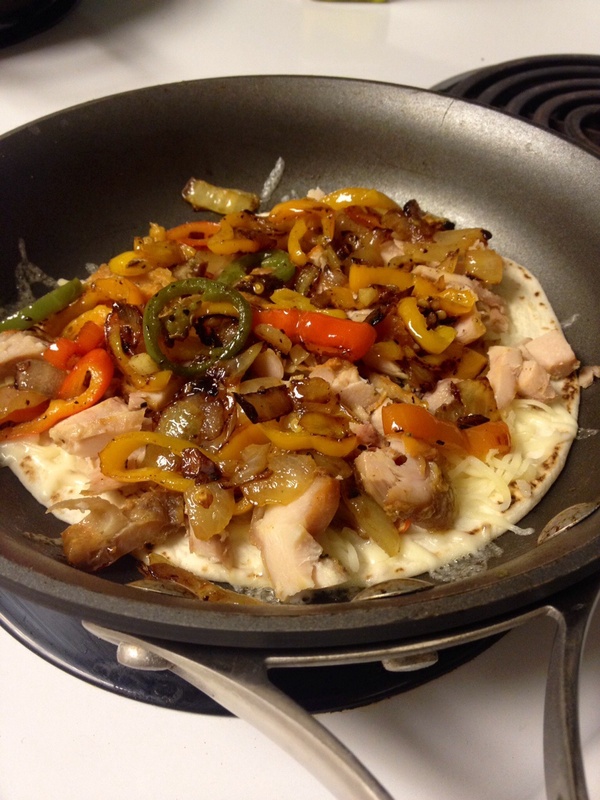 Place tortilla in, sprinkle with one layer of cheese, and put as much meat and veggies as you want on there. 3. 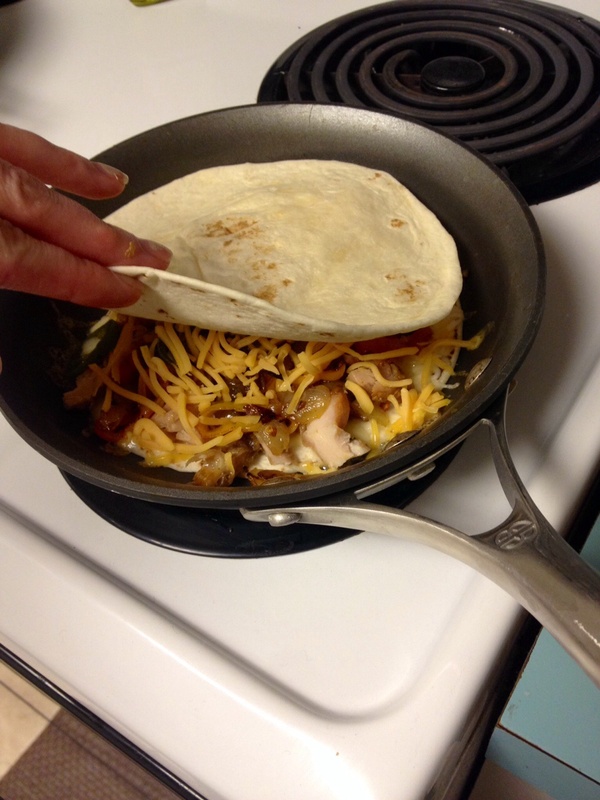 Put another layer of cheese on top of the meat and veggies and put another tortilla on top. *Note* I used flour for my husband and corn tortillas for me. I let them cook a little longer in a little extra butter and got it nice and crispy. Let me tell ya, it was delicious! 4. Flip that bad boy over and allow both sides to become deliciously golden. That was so easy, I bet you didn’t even have to set your wine glass down! Mmm, that looks really good. Don’t suppose you have a simple to follow recipe for enchiladas? I want to make them so bad but I don’t know how to do the “pulled” chicken thing. Oh, nice. I’d love to see the one for the chicken! Cream Cheese Chicken Enchiladas is up!